Why St Winefride's Well is known as the Lourdes of Wales and an order of nuns run the nearby guest house. The legend says that a well sprung from the ground at the place where St Winefride, a noblewoman who lived during the 7th Century, was murdered by a local chieftain after she spurned his advances. 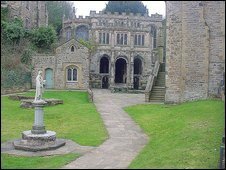 Her suitor, Caradog, is said to have cut off her head with his sword but she was restored to life by her uncle, St Beuno, and dedicated the rest of her life to holy works, becoming a nun and abbess. The well which bears her name has been a destination for pilgrims since the medieval period and continues to attract visitors to this day, giving Holywell the unofficial title of the Lourdes of Wales. St Winefride's Chapel was built around 1500 and encloses three sides of the well. Its construction was paid for by Margaret Beaufort, mother of Henry VII. It is the only such well to have survived the Reformation as a place of public pilgrimage. And because the well has continued to draw people over the centuries, the town of Holywell has needed guesthouses to accommodate them as well as a hospice for the ill who came with the hope of being cured. The nuns: Today, the former Pilgrims' Hospice, New Road, Holywell, has been converted into St Winefride's Guest House - and it's run by an order of nuns. The Bridgettine Sisters, who live next door, took it on after it was closed in 2002 by the Sisters of Charity of St Paul the Apostle who had run the building as a hospice for 130 years before eventually turning it into a Catholic guesthouse. St Winefride's Guest House was renovated in May 2008 with the help of the Heritage Lottery Fund and, like the well, it is open all year.